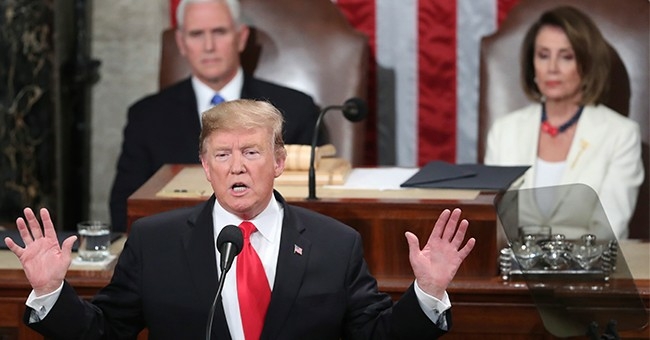 For anyone who still has not figured out how a businessman who had never held elected office defeated the nation’s most powerful political machine to win the presidency in 2016, President Trump’s State of the Union speech on Tuesday night should provide the answer. President Trump is at heart a builder, a common-sense problem solver, and he offered an inspiring vision of restored greatness to a nation that has been told for years our best years are behind us and that our future would be one of managed decline. And he laid out that vision with a moral clarity that is sorely needed in this divided nation. As expected, the president reminded the nation of the progress made so far by his administration. Tax relief and regulatory reform have fueled a dramatic economic expansion that has benefitted all Americans, and even the Democrats had to stand and applaud as he recounted the tremendous economic gains made by women in the last two years. From the dramatic improvements in the state of American energy production to the rebuilding of America’s military, the president recounted the achievements of his first two years in office. All of those themes had figured prominently in his campaign speeches and, though there is much work still to be done, we were reminded that he was following through on those promises. But it was in his clear and simple statements that America will never be a socialist nation and that we have a “moral duty” to protect our borders that President Trump identified in statesman-like terms the existential threats to our nation and offered the moral clarity that should guide our response to those threats. Those moments echoed the president’s historic 2017 speech in Warsaw in which he cast current policy disputes in the light of several simple questions: Does the West have the will to survive? Do we have the confidence to defend our values? Do we have the respect for our people and their way of life to defend our borders? Those questions are as fundamental for America today as they are for the West as a whole. Mainstream Americans rightly sense that we are on the verge of losing something that is essential to our fundamental liberty and to our identity as a nation. The nation is the most divided and polarized as it has been since the urban and campus riots of the 1960s. In those days, however, liberals advocated for an increased role for government, but they did so largely within the bounds of our constitutional republic. Today’s radicalized left, however, is openly socialist, advocates suppression of ideas that differ from their own, and justifies intimidation and violence as legitimate tactics to silence dissent. Abortion “rights” are being extended to the day of an infant’s birth. Radical ideas that were once confined to the fringes of academia are now winning elections and making policy. Underneath those radical policies lie fundamental questions of American values, of the moral underpinnings that will guide America into one of two futures. Do we believe that the purpose of government is to protect our God-given freedom or to impose uniformity of thought and action in every aspect of our lives? Do we believe in economic freedom or will we allow politicians and bureaucrats to decide what we can earn? Do we believe that Americans have the right to speak their minds even if others disagree, or will all of America fall under the constraints of political correctness? Is the goal of our foreign policy to protect American interests or should American interests be shoved aside to support the globalist agenda? Each of those questions will be answered by what happens with border security. The radical left tries to claim the moral high ground in their support for open borders, and they throw the tired old accusations of racism and hate at anyone who supports border security. But those arguments are paper-thin. If the millions of illegals streaming across our borders were going to vote Republican instead of Democrat, the Democrats would have already built a wall, and mainstream America knows it. If those millions of illegal immigrants get to the voting booth – and they will unless the president succeeds in protecting our borders – then America will become a one-party nation, and that party will be socialist. And, given the authoritarian tactics we are seeing from the new leftists, your right to speak your mind and other fundamental American rights will disappear along with your right to your own earnings. And if we are to keep our God-given freedom, then protecting our borders is a moral duty.